The distinguished actor William Marshall starred on Broadway, played Shakespeare’s Othello on the London stage, sang operas, and later became beloved by 80s kids as “The King of Cartoons” on PEE WEE’S PLAYHOUSE. But he’s best remembered today as Prince Mamuwalde in the first Blaxploitation/horror film, 1973’s BLACULA. It’s the late 1700s, and the Prince and his wife have traveled to Transylvania on a diplomatic mission protesting the European slave trade. When their host, Count Dracula (Charles Macauley) insults them, they get up to leave. But Dracula has other ideas, putting the bite on Mamuwalde and damning him to a fate “torn by an unquenchable thirst. I curse you and give you my name. 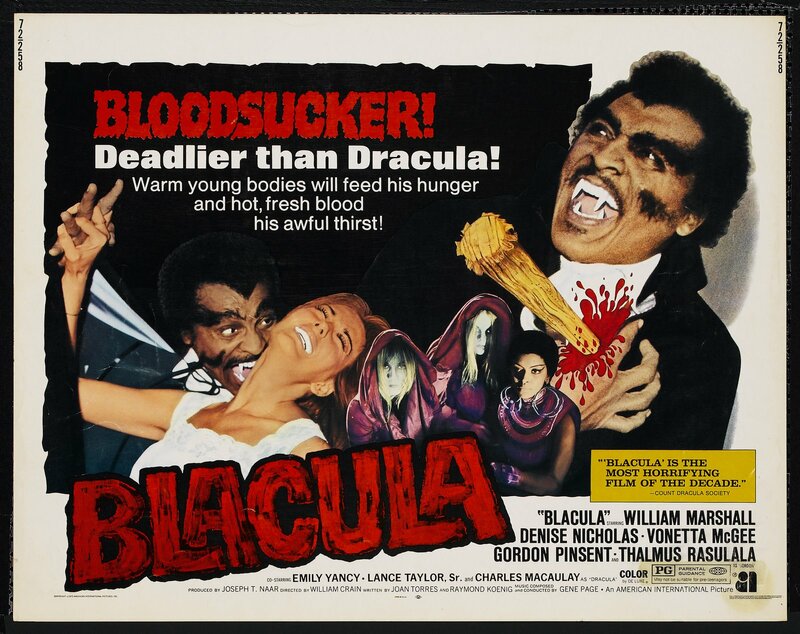 You shall be called….BLACULA! !” With that, Dracula locks the Prince in his coffin, and leaves his wife Luva to rot to death in their cell.